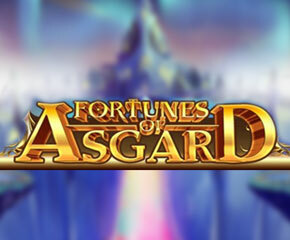 Microgaming has launched a slot named Fortunes of Asgard, based on the superpowers of Norse superheroes. In this slot, Microgaming has focused on two superheroes- Thor and Hellia. Visually, this slot looks amazing and exciting music in the background adds to the aura of the gameplay. Galaxy bonus, free spins, Thor & Hellia and gamble feature are the four main bonus features of this video slot. This slot is playable on all platforms including Android, Windows, and IOs from a starting stake of 20p. This slot comes with a 5X3 layout and offers 25 fixed paylines. Reels with a golden boundary are flying over the castles of Asgards. All the symbols in Fortunes of Asgard are related to the Norse theme. High paying symbol includes Thor’s hammer, a blue spellbook, a shield, and the pair of Thor and Helia while low-value symbols are denoted by the 10, J, Q, and K.
A blue lightning symbol is the wild icon and can substitute all other icons on the reels bar the castle bonus and castle scatter symbol. This feature is activated by landing three or more bonus symbol. In this feature, you will be shifted to a new screen where you have to tap on different galaxies to reveal the cash prizes behind them. This feature ends when you tap on the galaxy hiding the collect symbol. During any of the paid or free spin, you can tap on any of the two characters to know which the active feature is. Hellia will turn wild for the next spin, whenever it lands adjacent to the spell book symbol. Whenever Thor will land adjacent to his hammer, the reel turns completely wild. To gain ten, fifteen or twenty-five free spins respectively, you need to get three, four, or five scatters on the reels. This feature can be re-triggered by additional scatters during the free spins round. Tap on the heart/club button to activate this feature, now you will play 50:50 game where you can double your winnings. But if you lose, you will lose all your winnings. 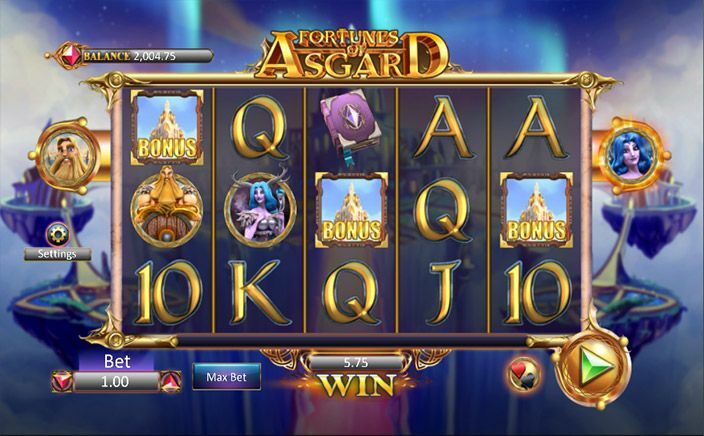 A variety of bonus features, top-notch graphics and attractive theme makes Fortunes of Asgard worth a spin.